What is ocean acidification and how does it affect our oceans? Have you even heard of ocean acidification? I guess the majority of people in the world haven’t and so here it is in basic terms. Acidification is exactly what you expect it to be. It is when water becomes more acidic. The ocean becomes acidic in many ways. The most common way is through the transfer of Carbon Dioxide back into oxygen. The tiny phytoplankton that makes up the sea plants and algaes of the ocean actually use photosynthesis just like the tree and plants on land to convert this CO2 back into Oxygen. In fact its thought that the ocean produces somewhere between 60-80% of the world’s oxygen. Some people even rate it as up to 90%. 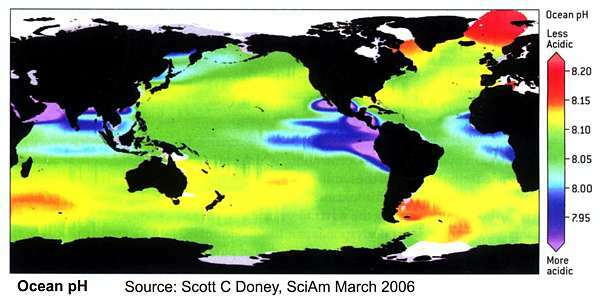 So basically as we produce more and more CO2, the ocean is absorbing it but there is an effect, the ocean is acidifying. The other source of acidification is plastics breaking down in the ocean. With the North Pacific gyre believed to have enough rubbish to cover Australia in 3m of plastic and more getting dumped in every day, the oils and polymers that make up plastic are leaching into the ocean and causing more issues. Acidity is measured by its pH (power of hydrogen) value. Fresh water has a pH reading of 7. Readings below that are considered to be acidic. Those above 7 are alkaline. Surface sea water had a reading of 8.2 a century ago. Today it has dropped to 8.1 because so much carbon dioxide has been absorbed by the world’s oceans. That may seem a small amount but the pH scale is logarithmic which means that 0.1 difference actually represents an increase in acidity of 30%. By the end of the century, the pH of surface sea water could have dropped to 7.8, which represents a decrease in alkalinity – or an increase in acidity, depending on your viewpoint – of around 150%. So what is the effect on the oceans and us? Some of the billions of tonnes of carbon dioxide we emit each year lingers in the atmosphere and causes it to heat up, driving global warming. But about 30% of that gas is absorbed by the oceans where it turns to carbonic acid. It is beginning to kill off coral reefs and shellfish beds and threaten stocks of fish. Very little can live in water that gets too acidic. Scientists estimate that oceans absorb around a million tonnes of carbon dioxide every hour. This increased acidity plays havoc with levels of calcium carbonate, which forms the shells and skeletons of many sea creatures, and also disrupts reproductive activity. Among the warning signs recently noted have been the failures of commercial oyster and other shellfish beds on the Pacific coasts of the US and Canada. In addition, coral reefs – already bleached by rising global temperatures – have suffered calamitous disintegration in many regions. And at the poles and high latitudes, where the impact of ocean acidification is particularly serious, tiny shellfish called pteropods – the basic foodstuff of fish, whales and seabirds in those regions – have suffered noticeable drops in numbers. In each case, ocean acidification is thought to be involved. Few scientists doubt that the impact on reefs will be anything short of devastating, however. The Caribbean has already lost about 80% of its coral reefs to bleaching caused by rising temperatures and by overfishing which removes species that normally aid coral growth. Acidification threatens to do the same for the rest of the world’s coral reefs. By the middle of the century there will probably be only a few pockets – in the North Sea and the Pacific. Millions of species of fish, shellfish and micro-organisms will be wiped out. Our oceans are our lifeblood and we need to act now to slow, even stop, rises in ocean acidification. You can play your part by refusing plastic and reducing your carbon footprint. Founder of Ocean Crusaders and world record holder for fastest solo circumnavigation of Australia on a monohull.